I was going to review the Lone Peak 3.0 but then realised that actually the more useful thing to do might be to look at my experience of running across the Altra trail range. 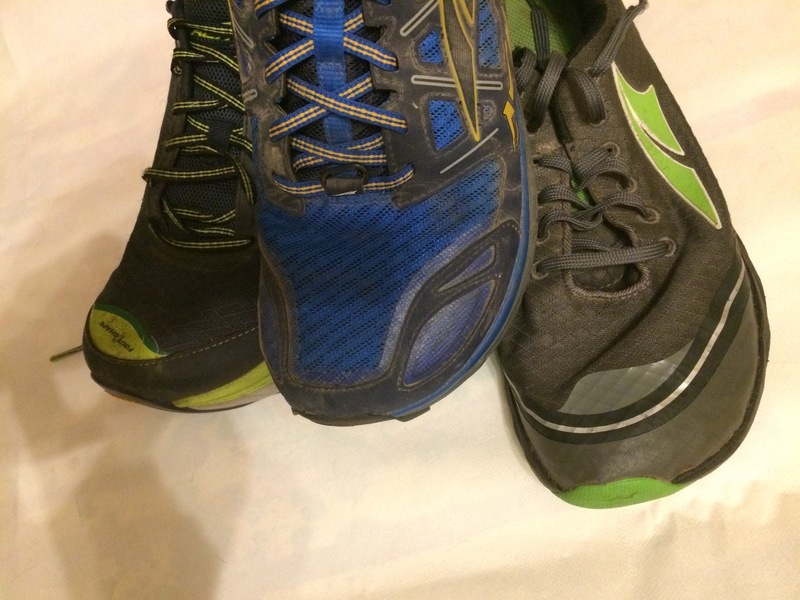 This review and comparison will look at the Altra Superior 2.0, Olympus 2.0 and Lone Peak 3.0 in which I’ve run at least 200 miles in each across a wide variety of terrain and conditions. Superior 2.0 It was a warm day in June when I first put my Superior 2.0 on, I’d bought them as a speedier alternative to the Lone Peak 2.0 – where the LP felt plush these felt more like moccasins, something you might find Native Americans wearing in the Old Wild West! As is often the case with Altra they sent the UK the boring colour way – grey with a hint of green and there was an air of wearing old ladies Hotter shoes rather than the latest innovative low profile trail running shoes. Anyway I was at one of my usual haunts and set off on a short 10km trail run (a trail run that I put all new shoes through) and we danced across the logs, bounded across the dry, hurtled through the damp and came unstuck in the wet mud! Uphill they were kind to my toes and grippy and downhill they felt stable enough but with a backend that needed a bit of control. The Superior feel like fast footwear, you don’t forget you’re wearing them despite having the same upper comfort levels of other Altra shoes – perhaps it’s the more tigerish feel of putting on a pair of runners that you know are built to go a bit quicker. Lone Peak 3.0 I opened the box and looked down and went ‘wow’. Altra has finally delivered a shoe I could simply look at and think ‘OMG’. The LP3.0 was a big departure from the second series. Yes, I’m not made keen on the blue or the black colour ways (the only ones available in the UK) but I wanted to ensure they were bought from an independent UK retailer. I knew I’d be delighted to take them out for a spin but it turned out that the first chance I’d get to use them would be on race day at the Chislehurst Chase. Now we all know the thing about not wearing them straight out of the box for something like a race but I felt confident in them and I knew the route as it used to be an old stomping ground of mine. Within seconds of bounding our of the starting line I realised that the Lone Peak was an improvement and a half on the previous editions but it would it replace the LP2.0 as my Altra of choice? Olympus 2.0 Riding high like Zeus above the mere mortal men on the trail here I came in my mighty Olympus 2.0 (or so I thought). I had bought these with the Skye Trail Ultra specifically in mind. The Olympus it turned out were not the best choice for this race but they have proved to be a prudent choice for less gnarly routes. The Olympus were as difficult to find in the UK as the Lone Peak 3.0 and in this instance I really did want an exciting colour and so bought them from France as they had the blue and neon yellow version. The most interesting advance in the Olympus over previous versions (and the reason I was willing to give them a go) was the Vibram outsole and more aggressive approach to the lugs. Hitting the trails you could instantly see that the new, more cultured outsole was going to be of benefit and the level of comfort from all the A-bound technology sitting between you and the trail was ridiculously sumptuous. So what do Altra say about each of their footwear? Why mess with perfection? Last year’s award-winning favorite is back with the same look and feel as its predecessor, but with new color options and sidewall reinforcement. The FootShape™ toe box lets your toes relax and spread out in uphill and downhill trail conditions while the fully cushioned Zero Drop™ platform helps you maintain proper form across long distances. TrailClaw™ outsole technology features canted lugs beneath your metatarsals for ultimate gripping in gnarly terrain. A removable StoneGuard™ rock protection plate protects your feet from sharp rocks and is removable for use on less demanding terrain. Named after eleven thousand feet of pure Utah peak ruggedness, the Lone Peak 3.0 is the latest version of the trail shoe that started it all for Altra. We added additional protection to the upper for increased durability and protection when the trail starts to bite back. The outsole has been re-designed and spec’d up with the all new MaxTrac™ outsole, offering more grip in all conditions. The StoneGuard™ has been sandwiched between the midsole and outsole to offer extra protection from those rocks trying hard to go after your feet. And your toes will be loving life in the luscious FootShape™ toe box up front. The legend continues with the Lone Peak 3.0. You asked, and we delivered. Our popular, max-cushioned trail shoe returns with a completely revamped Vibram® Megagrip outsole and a softer, more flexible upper. The new outsole dramatically enhances traction in uphill and downhill terrain while maintaining the max-cushioned feel you love. Traction and durability improvements have also led to a reduction in weight over its predecessor for a faster ride. An impressive 36mm stack height runs evenly from front to back and features an A-Bound bottom layer to add a spring to each step and EVA™ top layer to take the bite out of the rugged terrain. And like every Altra shoe, the FootShape™ toe box keeps your feet happy, relaxed, and stable through uphill climbs and downhill descents. Much has been made of the foot shaped toe box and the zero drop, both intended to enable a more natural running form and having been a runner who has run extensively in zero drop shoes and Vibram Fivefingers I can tell you that the Altra way has helped me achieve a better style of running form, especially when I’m tired – I don’t breakdown nearly as quickly. The Superior are a great shoe, I use them for XC and shorter distance races (10, 12 miles) I don’t run ultra marathons in them even though I probably could. The lower profile offers the greatest connection to the trail but it also offers the least protection and you can feel this. Everything has been stripped down from the tongue right through to the upper – this is not a criticism but an observation. In my opinion the Superior benefit greatly from this more stripped down approach as they really do feel quicker than their trail siblings and have a lot in common with the Inov8 Trailroc. The fit is generous around the toes – as you might expect – this being the Altra USP, the heel cup is a little loose (a problem some find with Altra), the trail gaiter remains a great asset and the grip is reasonable. The upper is an improvement on previous versions of the Superior but is still not amazing, the overlays in the latest version of 2.0 seem to have addressed this a little but I expect that Altra will need to consider a bit of an overhaul once again. The upper is remarkably comfortable though (again much like the Inov8 Trailroc 235) and it does feel like a lovely pair of slippers as you run round the trails. The upper drains and gets nice and dry quickly too which for someone like me is a real bonus. The issue I think most will have will the Superior 2.0 is the grip – in the UK were things like rain and mud exist the Superior struggle to get traction and can become a little bogged down. However, in the dry or through the moist trail they’ll confidently take on everything that you thrown at them and you’re feet will feel like they’ve enjoyed the experience. In terms of longevity and durability you might find that these aren’t going to last like an old pair of Walsh – they are far from bombproof. This could be said of both the upper and the tread as both will ear down pretty quickly. My boss who owns a pair of Superior says that the tread has already started to peel away after only 100 miles and my pair once they reached 200 miles looked a little abused. There was also soome gentle fraying on the upper by 200 miles and given the mileage I will put in this makes the Superior seem like an expensive shoe. However, they remain fun and lots of it. The Lone Peak are the trail shoe that have saved my feet, I realise this is a big statement but its true. I started with the Lone Peak 2.0 (several pairs) and loved them to bits.I ran the Thames Path 100 in them straight out of the box, having never tried Altra before and never looked back. Lots of runners, including the excellent review ‘Ginger Runner’ suggested that the Lone Peak 2.0 felt more like a skater shoe than a pair of running shoes – he had a point. However, the upper, support and overall feel as well as the visuals of the LP2.0 were stunning. My first pair ran well in excess of 1,000 miles before they even began to consider retirement (they still run today but only on training runs). With the 3.0 though the Lone Peaks have undergone something of a transformation. More overlays, less heel cup (so less skater shoe feel), revised grip, Abound material for support but with all the things you previously loved. The visuals have also gone for a more Americanised look, throwing out some of the more understated ‘European’ feel of the 2.0 and 2.5. The rewards for this effort can be felt almost immediately on the trail. The LP3.0 is lighter, faster, better fitting and better at dealing with muddy terrain than ever before. It’s the shoe you always wanted from Altra and so far none of the problems (other than its a bloody expensive shoe). I’ve committed to several hundred miles in this shoe since I bought them (the moment they arrived in the UK) and each run has given me comfort and pleasure in a way that not even my much loved yellow LP2.0 could. It’s things like the attention to detail I love, the little clip for the gaiters on the front of the shoe and obviously the trail gaiter trap on the reverse, the removal of the ridiculous rudder continues and the graphics lifted partly from the 1.5. What’s not to like? The shoe also now comes in a pertex and a booted version. The boot version looks like it’s going to try and take on the Hoka Tor series and the Pertex version of for those of you that are insane enough to wear them – seriously who wears waterproof shoes, once it’s gone over the top its like your feet have gone for a swim and aren’t getting out the pool! With the right marketing and supply chain these shoes should be taking over the trail running world but Altra seem to have an issue, especially in the UK with both its communication and its stock levels (this needs to be cleared up because growth through word of mouth alone will not overhaul Hoka, Inov8 and Salomon). Great shoe, more of the same please. Best for: Ultra distance, long slow trail runs, hiking, mud and mayhem! The Olympus are pictured above taking on the demands of the first 30 miles of the Skye Trail Ultra and what a great pair of shoes they are. Not perhaps the best choice for the first 30 miles of Skye but my word they’ve covered themselves in glory ever since – especially during the Brutal Enduro and several very long training runs on and around the North Downs Way. Having not tested the earlier versions I had no comparison for the Olympus but the main issue seemed to have been with the 1.0 and the 1.5 was that the grip was shockingly rubbish. So Altra gave us a Vibram outsole! In the picture below you can see the toe bumper and the depth of the lugs on the Olympus 2.0 – you’ll also see the new leg pattern from the LP3.0 (wouldn’t mind seeing a vibram version of this!) There’s a couple of different compounds too which do much the same job as say Inov8’s Tri-C but basically its got hard and soft sections to deal with the different types of terrain you’ll be facing. The Olympus has a big stack height (36mm) so its clearly built for the long slow journeying rather than the faster more trail intimate experience of the Superior but that’s not to say that you don’t get feedback from the route because you do – just not quite so telling on the feet as with a less supportive shoe. The good news is that after several hundred miles both the upper and the outsole are wearing well. I have yet to find any significant durability issues and believe me I enjoy taking my running shoes through the nasty kinds of trails and I’m always on the lookout for wet mud and hills (preferably both) to give them a good test. The grip is impressive mostly (other than in the thickest mud, but very shoes deal with this well) and overall the Olympus are a kick arse pair of shoes. As a previous wearer of Hoka I can tell you that Altra (rather than Hoka) have got the maximal shoe right (for me at least). Stable, fun, faster than you expect and they look the business rather than like clown shoes! So which would you go for? For me that’s really easy – I’d have all three but if I was only going to have one then I’d go for the classic Lone Peak 3.0, a tremendous shoe. However, each of the Altra trail shoes does something quite unique and I like having them all for both training and racing. I still believe that Altra is a niche product and not suited to everyone so I’d always advocate a try-before-you-buy if at all possible but if you are looking to dump the Hoka because they don’t feel stable enough, your feet have been bruised to buggery by the lack of cushioning on your Inov8 or you simply want a change from the black and red of Salomon then these might be the choice of shoe for you. Where can I try Altra? Do Altra (or their stockists or anyone) pay you or give you kit to write this? My love for Altras goes through peaks and troughs, I drift away and try other brands mainly because of their lack of availability and “premium” cost in the UK. Then i’ll find some on eBay or get another pair of LP2’s (until I bite the bullet and get some 3’s for next year) and am reminded of how much I like them.